Prime Point Srinivasan made a presentation to the MBA students of VIT University, Chennai campus on 'Crisis communication management' on 1st August 2018. He shared as to how the crisis gets formed and the techniques to handle them without damages to the individuals and the organisation. The slide show is given below. The ezine PreSense (Published by Prime Point Foundation) and Sansad Ratna Awards Committee organised an interactive session with Rajya Sabha CPIM MP T K Rangarajan on Saturday the 22nd October 2016 at HSS Library, IIT Madras. It was a closed session with select invitees who aspire to join or grow in politics. T K Rangarajan is one of the well respected political leaders in India for his balanced and intellectual views. Though he is a communist leader, he has more admirers in all the parties, including BJP, irrespective of political ideologies. T K Rangarajan advised the youth to join politics only after understanding the problems of the country and the society. He quoted the example of Mahatma Gandhi, who went round the country as suggested by Gopalakrishna Gokhale to understand the problems of the nation, before his joining politics. He also traced the history of politics. He defined the politics as the 'concentrated economy'. He said that in the world all the wars have happened with focus on 'properties'. He also quoted from Ramayana and Mahabarata, as to how the desire to acquire property had led to dispute and war. He also explained as to how the economy changed in the past centuries. Last century changed the 'barter trade' to 'merchant trade'. He raised a thought provoking question to the audience. Thousands of years ago, India had great scholars like Aryabatta, Bhaskara. Also India gave 'zero' to the world and we had great mathematicians. In spite of the ancient wisdom, India did not attempt industrial revolution. But it happened only in London. He explained as to how the religion prevented industrial revolution even in England and how it was overcome. He concluded that any religion cannot stop the growth of science and technology. To a question who was his Guru, he said that as an industrial worker, he learnt many things from workers. His leaders guided him in politics. To another question on the linguistic partition of India, T K Rangarajan said that before Independence, Madras Province consisted of Tamil Nadu, Andhra, Kerala and Karnataka with Madras as Head Quarters. Though the four states were under Madras Province, the Congress Party had the Presidents based on the language only. Hence, he said that though officially the states were under single province, practically, they had linguistic division, even prior to independence. 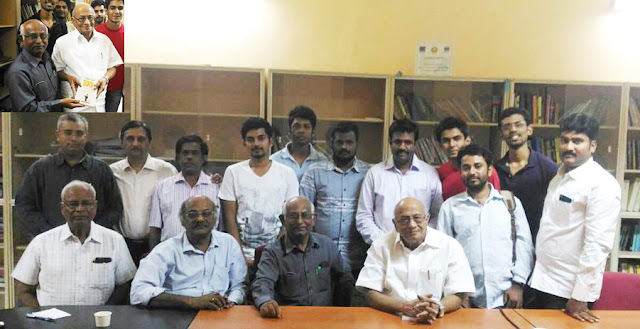 Some of the elected representatives of Students Legislative Council (SLC) of IIT Madras including Venkat (Speaker of SLC), Dr Sudarshan Padmanabhan were also present and interacted with T K Rangarajan. Nurullah, Vice President of Sansad Ratna Awards Committee presented a memento to T K Rangarajan. In appreciation of the discussion, the participants honoured T K Rangarajan with standing ovation. 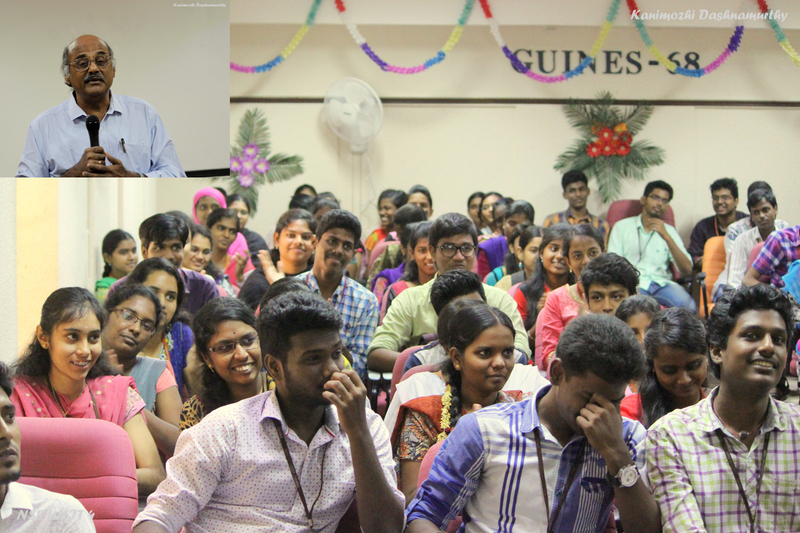 Prime Point Srinivasan addressed nearly 100 National Service Scheme (NSS) students of Anna University on Saturday the 22nd October 2016. While addressing the students, Srinivasan, insisted the students to use the social media with high level of responsibility and not to get addicted to social media. He advised the students to understand the difference between the real world and virtual world. He said that there were three eras that influenced the mankind in the world, particularly youngsters. 1. Before the introduction of internet commercially i.e. before 15th August 1995. 2. After the introduction of internet, but before the emergence of social media like Twitter and Facebook i.e. between 1995 and 2004. 3. After the emergence of social media i.e. after 2004 till date. Srinivasan said that before the concept of internet, the people had enough time to interact personally with each other and to spend enough time on various productive activities. He considered the second era as a 'Golden era', during which time, the blogs and other internet tools emerged. These tools were very helpful to improving the writing and thinking skills of people. He expressed concern that after the emergence of twitter and facebook, youngsters spent lot of time in the social media in an unproductive manner. He also felt that the writing skills of the youngsters got damaged due to the shortened terms. Srinivasan cautioned all the youngsters, particularly, ladies not to share the private information in the social media and also not to share their passwords with others, however close they might be. He quoted examples of how the ladies were victimised because of the social media. Finally, he appealed to all youngsters to use social media like 'shoes' which are left outside the house and use them when necessary. He appealed to them to enjoy the real world by interacting with all friends, instead of spending time in the social media. The programme was organised by Anna University and National Council of Rural Institutes. Dr Arutselvan, Associate Professor of Media Science Department coordinated the event. Recently, Bish Mukherjee, an Indian Communication professional became the first Indian to be recognized with the highest honour that any communication professional can get in the world. He has become one of the less than 100 IABC Fellows in the world today. 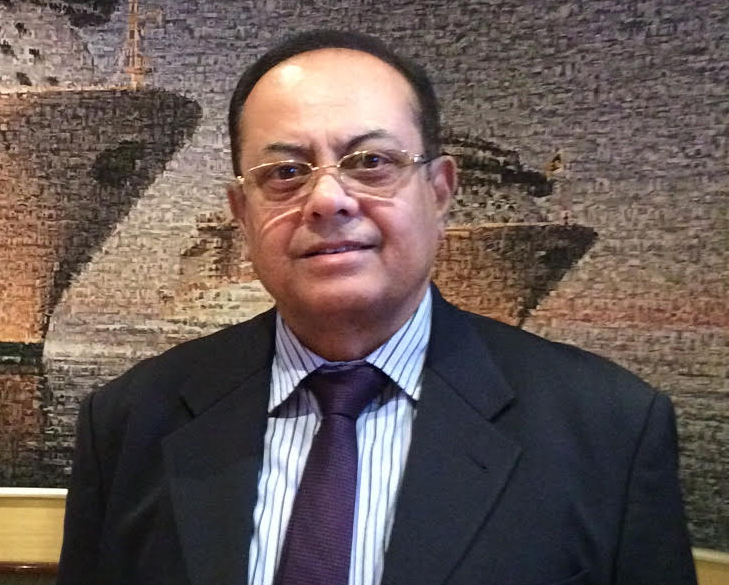 In an exclusive interview with Sukruti Vadula, Editorial Team member of PreSense, Bish Mukherjee shared his journey from a RBI official to communication professional. Excerpts. What made you enter the field of PR ? How did this start ? It was accidental. I was working in Reserve Bank of India (RBI) in Exchange Control when I was hand-picked by the Editor of Without Reserve, the house magazine of RBI, to help editorially him out with the publication. This was in addition to my regular duties as Exchange Control Officer (ECO), which in itself was a very heavy desk, as I was in-charge of issuing RBI permits for foreign travel. In those days you could not get foreign currency for travel overseas without RBI permits. In my role of ECO, I used to meet numerous VIP-s (or their senior representatives) and iconic people from different industries. I met cricketers, musicians, dancers, shipping magnates, travel agents, airline companies, eminent doctors, sportsmen and women and industrialists. I tried to take a realistic view of the applicants' requests for foreign exchange requirements and tried to help out in a genuine way. Word went around inside the bank that I was very people friendly and that I had PR skills. Soon I was made one of three RBI's nominees for the Association of Business Communicators of India (ABCI). That paved the way for me to later become the Secretary and then the President of ABCI. I got transferred to RBI's Without Reserve Cell and started work for RBI as their PR representative. In those days RBI had a Press Relations Officer but no PR Officer. My efforts at Without Reserve started yielding results as the journal got several awards in the coming years. In later years, my work in PR and editing work in RBI was recognised by the RBI Governor in the presence of the top brass of the organisation when I was given a plaque and certificate during the bank's platinum jubilee celebrations. I had left the bank many years ago but they traced me and offered me return airfares and hotel accommodation to come over to Mumbai and accept the award and also be part of the gala dinner etc. It was so touching and memorable. How did it feel to be the First Indian to receive the IABC Fellows award in the USA ? In 1987 when I received the Accredited Business Communicator's (ABC) recognition from the International Association of Business Communicators (IABC) in the USA, I was the first Indian to become accredited. There are 800 ABCs in the world today. I was in Colgate-Palmolive as the head of PR, Sponsorships and Publications at the time, and there was a big party at the US Club in Mumbai to celebrate it with the President of Colgate-Palmolive opening the champagne bottle in my honour. It was an unreal experience. Now, after so many years, I have been recognised with the highest honour in the world that the communications profession can bestow to a professional. It is an industry award bestowed by the IABC for the recipient's sagacity, experience, reach and overall contribution to the communications profession globally. There are less than 100 IABC Fellows in the world today. Once again, I am the first recipient of this top award in India. It is a very proud moment for me and for the communications profession. I am deeply humbled. Who is your role model and mentor ? I have never believed in soothsayers and parrot-readers for my success in life. I have believed in continuous upgrading of knowledge, skills and tactics, in unbeatable strategies, in hard work, sheer perseverence and staying focussed and calm despite provocations. I have learnt immensely from industry leaders, from my colleagues and subordinates, and from my peers and bosses. I started emulating successful leaders from my school and college days which lead me to earning the St Xaviers School Gold Medal for Elocution and the College Blue. I believe in standing up for honour and truth and never compromise on ethics. What is the road map for the freshers to soar in the field of PR ? Be honest. Be unambiguously truthful and never compromise with ethics. Freshers must learn to do jobs with dedication and commitment. They need to take on each job in an organised way, that is, to be sure as to what they are doing and to do it in the best possible way and then to measure the outcomes and communicate to the bosses. If you have done good or great work but are not able to measure the impact of that work to the company' bottomline and then to communicate effectively to management, then that job may not be counted by them for your career growth in the organisation. That really is the secret mantra for freshers. You being an Accredited Business Communicator(ABC), where do you see the standard of Indian Business Communication in comparison to the global market ? PR standards in India have evolved over the past couple of decades, thanks mostly to the plethora of multi-national companies entering the Indian markets. They have brought with them the best practices and guidelines that are of uncompromising standards. They have trained the staff in their Indian sites as per their requirements, they have brought in an era of Planning and Measurement in business communications that is so vital for an orgnisation's success. In the process, Indian companies are recognising the importance of communicating effectively as evinced from the various workshops they are running to upskill their staff. Mr Srinivasan of PreSense has conducted a few such workshops for Indian Bank, IOB and others. PR is an important function even in Government today as evinced from the Advisory role being played by Mr MB Jayaram in a major PSU today after he retired from the company he was working for. The impact is evident even in the education sector. Institutes and Colleges are competing with each other to get the best PR people as guest speakers at their campuses. It is all good for the Indian business communication scene. How will you define PR in your experience. There are many ways you can understand PR but there is only one way you can know PR - that is through experience and experience alone. Is PR just a "Call for Attention" mantra or much beyond. People generally think PR as media and publicity. What is your say. PR is really an all-inclusive, all-pervading concept. If you split the two words you will find the meaning yourself. Anything related to public (corporate public) is PR and anything that enhances the effective relationship of the organisation or the individual with that corporate public is PR. And if the word public includes media, publicity, events, publishing etc so be it. What is the Scope of PR in India and in the global market ? Scope of PR in India is massive. Association bodies that are espousing the cause of PR in India are doing monumental work and there is no denying it. The untiring professional efforts by the Public Relations Council of India (PRCI), ABCI, PRSI, PRCAI and other bodies must be commended in this respect. When the Union Carbide crisis unfolded in Bhopal, the company realised how important it was to have had a good PR outfit in India. They didn't have that advantage then. The World Vice-President for Communications at Union Carbide Mr Bob Berzok flew down the very next day from Connecticut and had a meeting with me in Mumbai. He asked for help. He asked me to join the company and immediately swing into action in crisis communications mode. I had to decline his gracious offer as I had just joined Colgate-Palmolive after very respectfully turning down job offers from Phillips, Hoechst and UTI. Bob asked me for 3 names which I readily provided. Bob recruited Mr Kishore Hattangadi who did a fantastic job at Union Carbide. Rest is history. Such situations are waiting to happen in many companies which do not believe in corporate PR. The sooner that gap is filled up the better it will be for our industry. We have a little catching up to do in India so far as global standards are concerned. The very fact that Indian companies send in so many entries to world competitions in communications but win very few awards is a pointer in that direction. Judging entries from all over the world at the Gold Quill Awards at Shanghai, I noticed that apart from US, Canada, UK and Europe, even China and the Philippines were winning heaps of awards in various categories but the Indian entries suffered from lack of slick presentation skills and adequate responses to the measurement criteria. We need to work hard on these two aspects to find a bigger place in the global scenario. Tatas, perhaps, is the only exception which keeps winning awards in communications year after year in various categories. What are your top three marketing and PR tips for the PR Professionals. Ministry of Human Resources Development (MHRD) of Government of India has published in their site the draft copy of National Educational Policy 2016 prepared by them. They have requested all the stakeholders to debate and submit their recommendations and suggestins to MHRD. 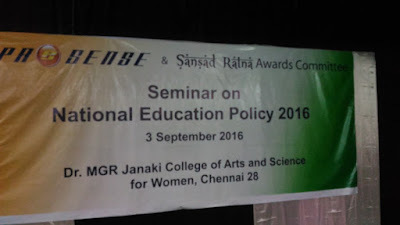 The eMagazine PreSense (published by Prime Point Foundation) and Sansad Ratna Awards Committee organised a seminar at Dr MGR Janaki College of Arts and Science for Women, Chennai on Saturday the 3rd Sep 2016. 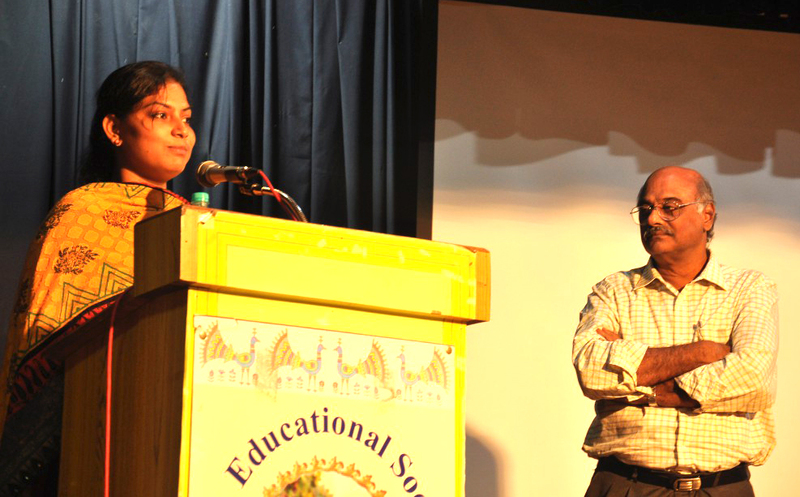 Susan Koshy, Editor of PreSense welcomed the audience and explained the purpose of the seminar. Sivakeerthi, education consultant coordinated the programme. The programme had two panel discussions. The first one on 'School Education' and the second one was on 'Higher Education, Research and Governance'. R Nurullah, senior journalist moderated the panelists. P Ravi (Regional Director of National Institute of Open Schooling), Dr Jahitha Begum (HOD, Department of Education, Gandhigram Rural University) and Lakshmi Radhakrishnan (Former Chairperson of Madras Dyslexia Association) were the panelists for 'School Education'. In the second panel, Dr A Kalanidhi (Former Vice Chancellor of Anna University), Dr Sudarsan Padmanabhan (Associate Professor of IIT Madras), Dr R Jagannathan (Former Vice Chancellor of Middle East University, UAE) and Harish Metha (Secretary, SS Jain Education Society) shared their views on higher education. The participants also shared their suggestions for incorporation in the recommendations. A Sub Committee headed by Ramesh Sethuraman is preparing the recommendations for submission to MHRD. Bhawanesh Deora, Secretary of Sansad Ratna Awards Committee proposed vote of thanks. · Dr Santhosh Babu IAS (CMD, Tamil Nadu Handicrafts Development Corporation Ltd - He brought back to School more than 12000 'out of school children' in Krishnagiri district as District Collector - Appreciated by Dr Abdul Kalam). Vinobha Bhoopathy, an enterprising advocate launched Vinobha IAS Academy at Velacherry, Chennai on 29th August 2016 to prepare IAS aspirants to face the examination and interview. Dr Anbumani Ramadass MP inaugurated the IAS Academy and spoke about the role of bureaucracy in the democracy. As a former Union Cabinet Minister, he quote several examples of how bureaucracy has saved the system by providing proper guidance to the Government. He also quoted the example of Smt Amudha IAS, who did an excellent work at Dharmapuri District. He suggested all IAS aspirants to prepare well for the competitive examination and be successful. He suggested them to keep the interest of the nation uppermost. Prime Point Srinivasan spoke on Leadership Communication. He was quoting the examples of how a leader emerges in a situation. He suggested that a leader should be a visionary and also a good communicator. He explained as to how body language, eye contact, listening and verbal communication skills make a good leader. He quoted the example of a young political leader, when introduced to him was casually shaking hands exhibiting an arrogance. Such gesture and body language may not give a good impression to others, he added. E Ramesh (Formerly in civil service) and Nivas IAS shared their experience. Vishwa Samvat Kendra is honouring journalists across the nation for positive journalism for more than two decades with 'Narada Awards'. For the first time they selected five journalists of Chennai from (1) magazine (2) Newspaper (3) Radio (4) Television and (5) Digital categories. K. Srinivasan, Founder, Prime Point Foundation was honoured with Naradha Award under Digital journalism category for positive journalism. 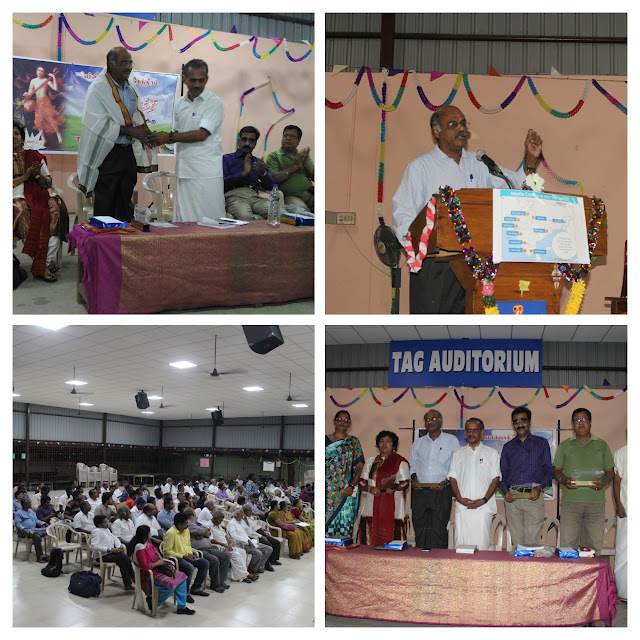 Smt Lokeswari (Editor of குமுதம் சிநேகிதி), Shri Sudarsan (All India Radio) and Shri Nijanthan (TV producer) were also honoured on 7th August 2016. Prime Point Foundation maintains various online discussion groups since 1999 on different subjects like India Vision, Communication, Journalism, etc. Also the Foundation publishes a 'digital only' eMagazine PreSense since March 2006 spreading positive journalism. Though Srinivasan received the Award personally, he dedicated this recognition to his Mentor Dr Abdul kalam who inspired and encouraged him towards positive journalism. Also the dedicated ezine PreSense team and Sansad Ratna team have made this possible. The ezine's tagline itself is 'spreading positive vibrations'. In the acceptance speech, Srinivasan made out the following points. Naradha (நாரதர்), the sage in the ancient epics was a great communicator. He was a carrier of communication between the people. Unfortunately, he is being portrayed wrongly as a person creating conflict. Hence this award is named after Sage Naradha. 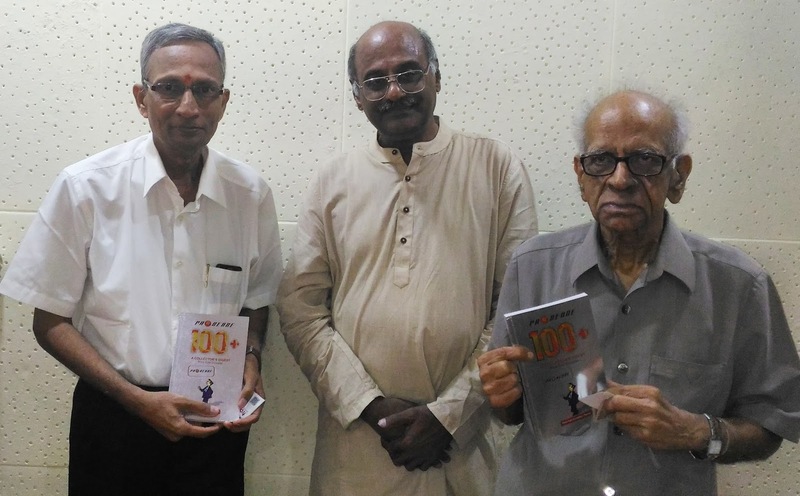 Srinivasan said that he used to quote in his lecture sessions on communication and journalism as to how Lord Krishna and Hanuman were the greatest communicators. As a communication professional himself, he used to wonder about the communication strategies adopted by Lord Krishna on several occassions. In Ramayana Lord Ram after meeting Hanuman for the first time, introduces Hanuman to Lakshmana as a great communicator. Through two slokas, Lord Ram describes the essentials of good communication quoting Hanuman. This is relevant even today. From next year, Vishwa Samvat Kendra will be honouring the journalists for positive journalism under different categories in other centres of Tamil Nadu also. National Institute of Technical Teachers Training and Research, Chennai (Ministry of Human Resources Development, Government of India) has organised a four week programme to the engineering faculty members and civil service officials of Bangladesh Government. Prime Point Srinivasan addressed the participants on how to leverage internet and social media for education purposes. He shared as to how Wikipedia, Blogs and Podcasts can be of great use for education purposes. He also suggested them to start their own blogs and share their thoughts. 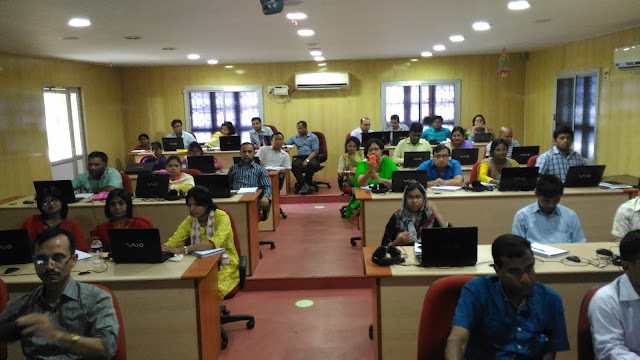 NITTTR had provided laptop and internet connectivity to all the participants. Dr. Brazendranath Sarkar, one of the participants created a blog on the spot for himself. Some of them expressed their eagerness to create podcasts. The programmed is organised with the help of External Affairs Ministry. The participants expressed their happiness about the stay at Chennai and the friendly attitude of people here. Dr Malliga is coordinating this programme. NITTTR is a specialised Institution under HRD Ministry to train the Technical Teachers across the nation. They also train the professionals from foreign countries. While inaugurating the ICTCON'16 (Information, Communication and Technology Conference 2016) at Saveetha Engineering College, Chennai, Prime Point Srinivasan advised the students to go for innovation, to make India strong at global level. "Though Indians have very great capability and knowledge of global standards, India has not brought out any global product like Microsoft or Adobe. Many Indians are working behind these products. At global level, India is at 81st position in the Innovation index. Hence, Indian students should innovate more and patent their products. The main problem with Indian youth is the lack of self confidence. They should realise their potential and work hard to achieve greater heights. They should not give up with initial failures", he said. He pointed out that another main hurdle was the 'I know it all attitude' amongst the corporates and many entrepreneurs. Because of this attitude, he said, that many organisations were not able to compete at global level. In the days of specialisation, the companies or organisations should approach the experts in the domain for guidance and support, instead of assuming that they have a better capability than the experts. He also quoted the example of Dharmaputra playing dice alone with Sakuni, when Duryodhana invited him to play dice. Dharmaputra, instead of playing himself, should have invited Krishna to play against Sakuni. The attitude of Dharmaputra that he could manage Sakuni alone, without seeking the expert advice of Krishna, had led to lot of crisis, Srinivasan added. During this Conference, 51 papers were selected for presentation. The best paper award was received by Vimal Jenifer SJ and Naveen Kumar, University College of Engineering, Tindivanam. They had presented a paper on "Clinical decision support system for classifying chronic kidney disease using data mining technologies". This National Conference was organised by the Department of IT of the College under the guidance of Dr Ganesh (Principal) and Mr Vijayaraj (HOD). The entire faculty team enthusiastically participated. Green India, a Chennai based NGO founded by Prasanna Venkatesan (Chartered Accountant) and V Ravi organised a Seminar at Chennai on the theme of 'Make in India - Start up Companies' on 26th March 2016. Many experts from Technology, Finance, Investment, Audit, Tax Laws shared their views. Prime Point Srinivasan spoke on 'Branding Challenges for Start up companies'. During his talk, he was critical about the existing and new companies who never gave importance to the branding and communication strategies. He expressed that the amount of importance given to technology, law, finance, etc was not given to communication. "The companies should package their performance, so that their marketability goes up. The mantra should be 90% performance and 10% packaging through communication techniques, i.e. branding", he said. Prime Point Srinivasan also said that many of the Indian companies were suffering from 'I know it all syndrome'. The CEOs never approached the right professionals for communication and hence, they were unable to plan proper strategies. Prime Point Srinivasan was assisted by Salin Amanda Louis, Co-Founder of Persona, a branding and leadership strategy firm. "What one needs to understand is that Branding is strategic and marketing is tactical. Many Indian companies focus a lot on the product but fail to brand and communicate the product with the right message to the right audience using the right tools at the right time." Salin Amanda said. She elaborated the importance of right message, right audience, right tool and right time with her own experience. She quoted the example of a company, who did not care for the advice of the consultant, later lost heavy market to their competitor who implemented the right strategy in right time. She was repeatedly insisting on the 'right time' to implement communication strategies. She also added that Branding was often mistaken for advertising which was not the case. Branding was the theme/concept while advertising was just a tool to convey the concept. She concluded by saying that in the current changing environment, only 'specialists' could make an impact than the 'Generalists'. Book Release: Shobha Warrier's "Diary of a journalist"